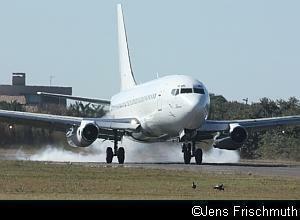 The 2010 Durban Airshow took place at Virginia Airport on the 17th of July, a week after the conclusion of the FIFA World Cup tournament. Durban, advertised as "the warmest place to be for 2010" during the World Cup, lived up to that claim for the airshow as well and proceedings took place under sunny skies on a calm, mild winter's day. A record crowd of well over 15000 spectators attended the event. Sadly, however, the airshow got off to tragic start. On the Friday morning, a skydive practice jump from a Dakota C-47TP went wrong and a skydiver from the South African Air Force's elite Golden Eagles Parachute team, Warrant Officer Brian Slade, lost his life in the accident. We extend our sincere condolences to Brian's family and close friends. Proceedings on the Saturday started off with helicopter displays by a Sikorsky S-330CBi helicopter and a radio controlled helicopter. The scheduled Golden Eagles Parachute display was cancelled because of the previous day's accident and was replaced by a civilian skydive display performed in honour of WO Brian Slade. 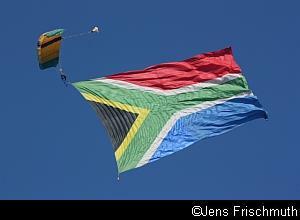 A giant South African flag was flown as a tribute to Brian. Later during the day, the Silver Falcons flew the missing man formation in honour of their Air Force comrade. The missing man formation is the Air Force's way of saying good bye to a fallen comrade. A mass helicopter formation was put together and flown by Durban-based Starlite Aviation. 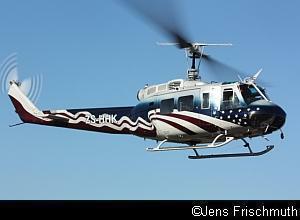 The fly-past was led by Kate Esterhuyse and consisted of 3 Robinson R-22s, 2 R-44s, a Eurocopter AS350 and a Bell 407. The fly-past was followed by an individual display of the Bell 407 flown by Steve Lodge from Starlite Aviation, who was a former Rooivalk display pilot. Steve flew a second Bell 407 display later during the day. 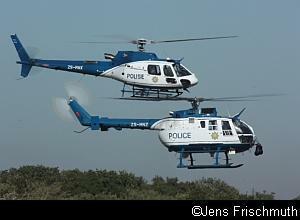 Further helicopter action was provided by the South African Police Services Air Wing. They staged a simulated hijack and rescue exercise that included the use of a MBB BO-105 helicopter and a Eurocopter AS350 Squirrel. 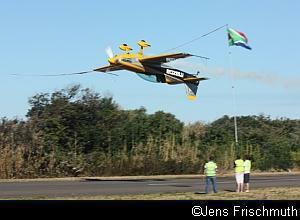 Later, Danie Terblanche displayed the capabilities of the agile Robinson R-22. 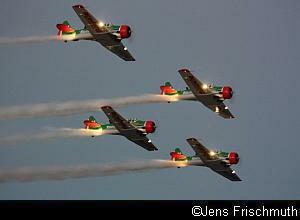 The SAPS Air Wing also displayed the low-speed handling and maneuvering capabilities of its Pilatus PC-6 Porter in a tight display flown by Frans Haasbroek. Other morning displays included a performance by the Snake Microlight Formation Team, Scully Levin's impressive truck-top landing in a Piper J3 Cup, CC Pocock's nimble display of his Bush Air Cessna 206 which included a spectacular pyrotechnics explosion as a finale, the display of a Magni Gyrocopter, Dave Mandell's display in his Aero L-39 Albatos Jet and the Ecko Unlimited Yak Formation flown with 4 Yak 18s and a Yak 52. The ever-popular Flying Lions Aerobatic Team kept the memories of the North American AT-6 Harvard alive with their performance in this legendary trainer. The display team consisted of team leader Scully Levin, Arnie Meneghelli, Ellis Levin and Stew Lithgow. To the delight of everyone, the four aircraft lined up in front of the crowd at the end of their display and revved their engines whilst putting on their smoke systems. The Goodyear Eagles in their Pitts Specials consist of three highly experienced pilots in Dennis Spence, Neil Trollip and Glen Warden. Before flying their high impact display routine, they performed a triple inverted parachute drop. 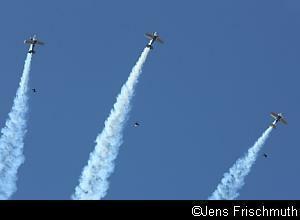 The three skydivers exited the planes at the top of a loop at the same time and whilst they glided back to earth, the three Pitts Specials flew circles around them whilst trailing smoke. A Bell UH-1H Iroquois, better known as the "Huey", brought the distinctive sound of this Vietnam-era legend to life on the day. Featuring a striking "stars and stripes" colour scheme, this particular aircraft served in Vietnam from 1972 to 1976 with the 101st Airbourne Cavalry and was later transferred to the National Guard. It was rebuilt in 1989 for medical evacuations and has been in South Africa since 2009. 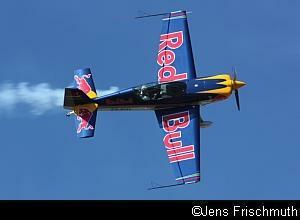 Glen Dell made a welcome return to the South African airshow scene after taking off two years to compete in the Red Bull Air Races. He thrilled everyone with a display in his brand new Red Bull Extra 330, the only one of its kind in the country and a plane that had previously only been flown for 3 hours and 21 minutes. Glen also flew the North American T-28 Trojan. 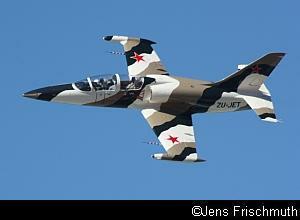 This warbird had been a scarcity on the South African airshow scene. The Silver Falcons, who recently thrilled a world-wide audience with their display at the opening ceremony of the FIFA World Cup in Johannesburg in June, flew two impressive displays at the Durban Airshow. The team, made up of Maj. Scott Ternent, Capt. Roy Sproul, Capt. Buti Tsebe, Capt. Gerhard Lourens and Maj. Nico Frylinck, reminded everyone with their precision flying why they are regarded in such high esteem. Maj. Scott Ternent, with 114 public displays, is now the most experienced Silver Falcons leader in the 43 year history of the Silver Falcons and Maj. Nico Frylinck celebrated his 50th display at the Durban Airshow. A special treat was the appearance of the AirQuarius Aviation Boeing 737-200, which was brought in from Johannesburg for the occasion thanks to Gavin Branson and Menno Parsons. Flown by Capt. Mark Nel and First Officer David Olivier, the display included a full touch-and-go on the short and narrow runway at Virginia. This is probably the biggest jet ever to have touched down on Virginia's 900 meter long runway. The crew prepared for the challenges of the display by spending time in the simulator with Capt. Karl Jensen during the week leading up to the airshow. As is traditional, the Reach for a Dream Raffle Prize Draw took place at the Durban Airshow again this year. Sponsored by Dennis Jankelow and Associates, the winner received a Piper Cherokee 180F aircraft and a Private Pilots License Course from 43 Air School. Proceeds from the raffle benefit the Reach for a Dream Foundation. 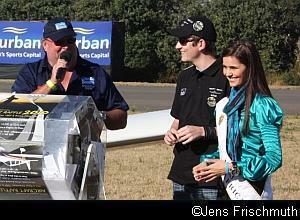 This year's winning ticket, drawn by Miss South Africa Nicole Flint, belonged to Carlo Travedi from King Air Services. The loud and fast display of the Mirage IIICZ flown by Lt. Col. Glen Warden was undoubtedly one of the day's highlights. This supersonic interceptor, which uses 200 litres of fuel per minute during its display, is capable of reaching speeds of Mach 2.1 and has a climb rate of 25000 ft per minute. 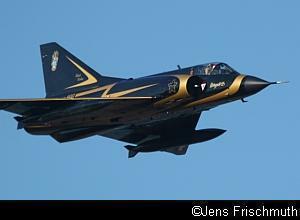 It first flew in November 1962 and is the only Mirage IIICZ still flying in the world, thanks largely to the personal efforts of Glen Warden, who puts a lot of work in to keep the aircraft in the skies. Glen provided commentary from the cockpit throughout his display and when the public address system picked up the "beep", signifying that the undercarriage was locked in place for the touch-and-go, the excitement rose even further. The high landing speed of this delta-winged aircraft meant that the touchdown was done at 170-180 knots, a really spectacular sight. The display ended with a high speed fly-past of just under 1000 km/h, after which Glen pointed the fighter straight up and disappeared out of sight. Other afternoon action included the display by the Gabriel Wings Aerobatic Team in their four Pitts Specials, an impressive dual display flown by Nigel Hopkins in a Pitts S-1-11B and Warren Haslam in the Sukhoi Su-29, the inverted ribbon cut and knife-edge pass flown by Brad Bennetts in his Extra 300, the display of a Rainbow Cheetah and a car versus plane race between a Subaru Impreza and a Pitts Special. CC Pocock's afternoon display was especially impressive as the pyrotechnics explosion looked very spectacular in the low afternoon light. The airshow ended with two dusk shows flown by the Snake Microlight Formation Team and the Flying Lions. The Flying Lions in their Harvards were led by Arnie Meneghelli and, as is traditional for their low light display, the rest of the team was made up of the team's ferry pilots. Andrew Blackwood Murray, Sean Thackwray and Gavin Brown flew the other planes whilst Scully Levin did the commentary. To add to the spectacle, the Harvards were fitted with Massey Ferguson tractor lights that shone into the exhausts of the Pratt and Whitney engines. It was already completely dark when the Harvards landed to end a very entertaining day, made possible by the excellent work done by the Durban Wings Club, Ray de Vries Sports Solutions and the generous support of the City of Durban.